Rashod saw Alexis out at a lounge while she celebrated her birthday with her friends and he knew there was something about her. After the two exchanged numbers, they talked for a few hours, went on their first date a week later and the rest is history. 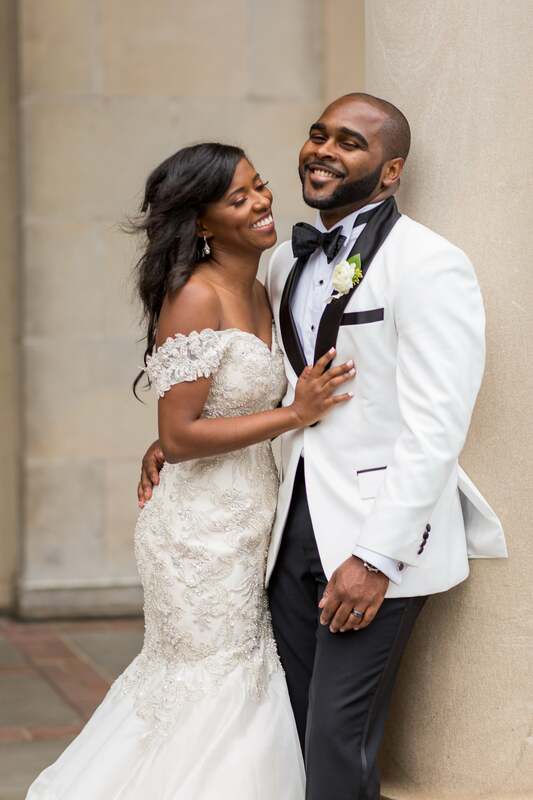 See all the amazing moments from their Atlanta wedding! 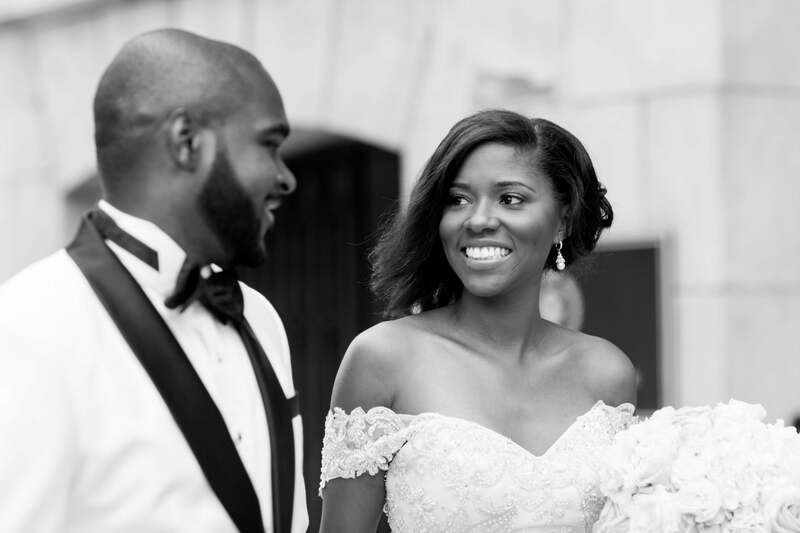 "Prior to the wedding, I was a little stressed with how everything would come together, but on the day of the wedding, I was the calmest than I ever expected to be as a bride," Alexis shared. "I realized I was marrying my best friend and it could get any better than this feeling I was happy, excited, emotional, and just felt loved by all the people that surrounded and supported me. I enjoyed every bit of being a bride. It was more special than I could have ever dreamed of being. " 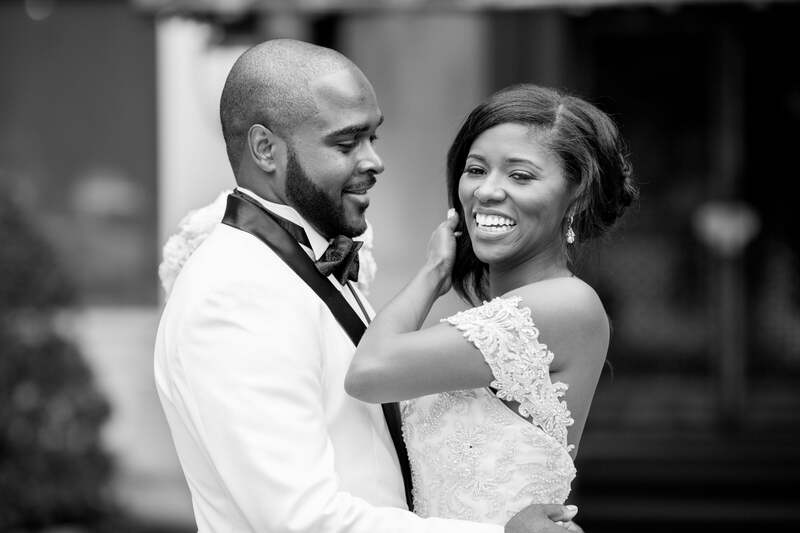 In April of 2016, Alexis suggested that she and Rashod enjoy a dinner date night out and he happily obliged. Little did she know, he was going to take the moment to propose! 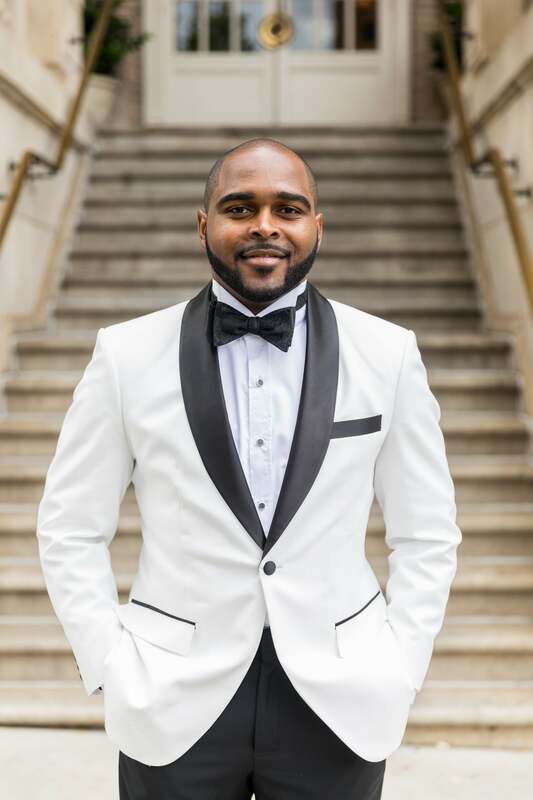 Getting the waiter in on the surprise, the restaurant cued up their favorite song and before Rashod could even get down on one knee, the entire restaurant erupted into cheers! After he asked the big question and Alexis said yes, the two went to a bar close by where all their friends were waiting to celebrate the moment. 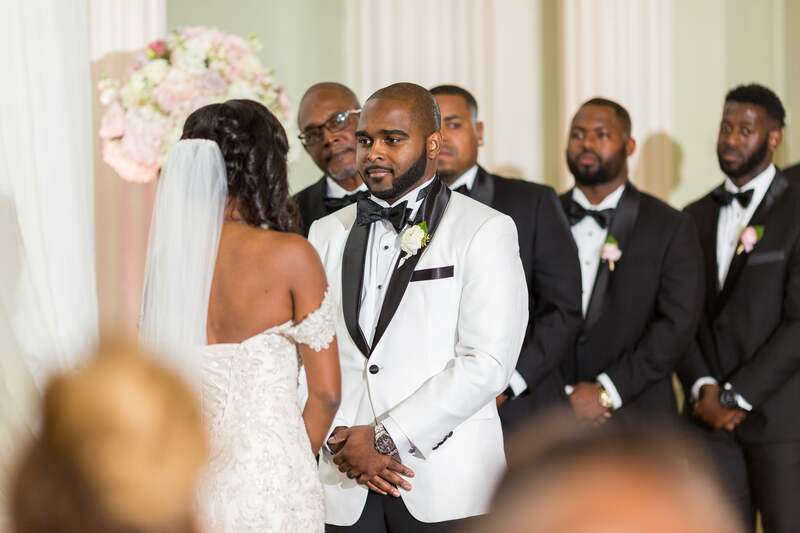 "Everything went just how I always envisioned," said Rashod of his big day. "It was difficult deciding on the style of dress I wanted because I was conflicted with whether I wanted something simple, or glamorous. It took me nearly 5 months to find a dress that I felt was The One. I was indecisive on the style." 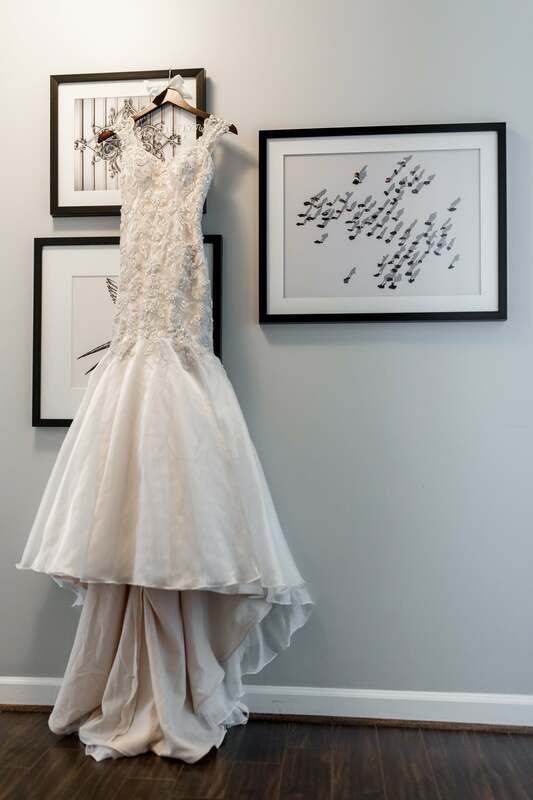 But when she found the dress of her dreams, Alexis was over the moon! 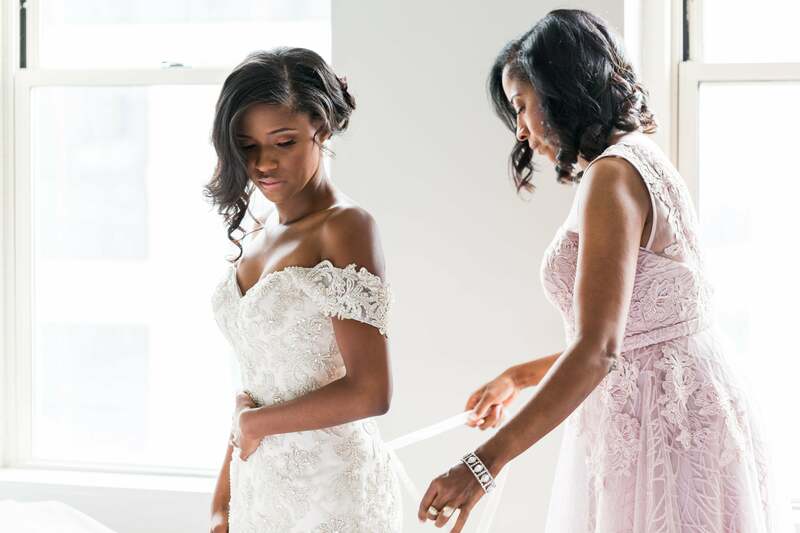 "All of the bridesmaids were my close girlfriends that I met in high school, undergrad, and grad school," Alexis admitted. 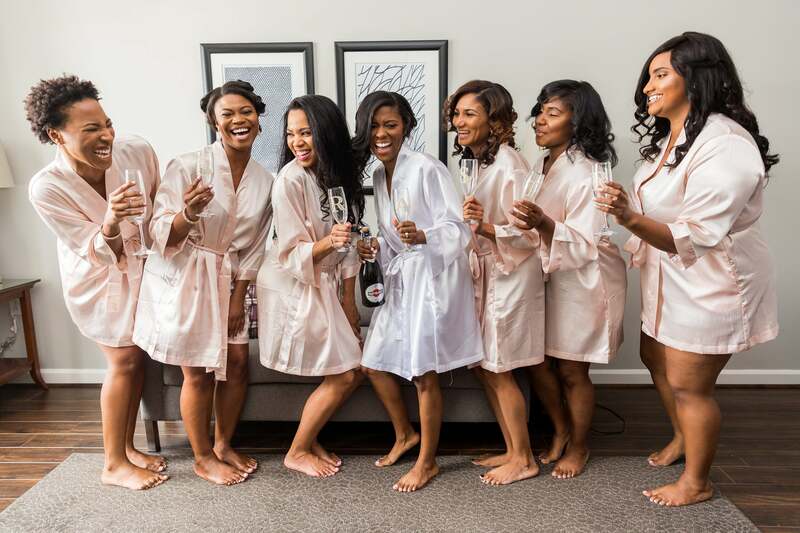 "I chose not to have a maid of honor because I felt like I was close to each and every one of my bridesmaids in different ways, and I did not want anyone to feel less important of a friend to me." 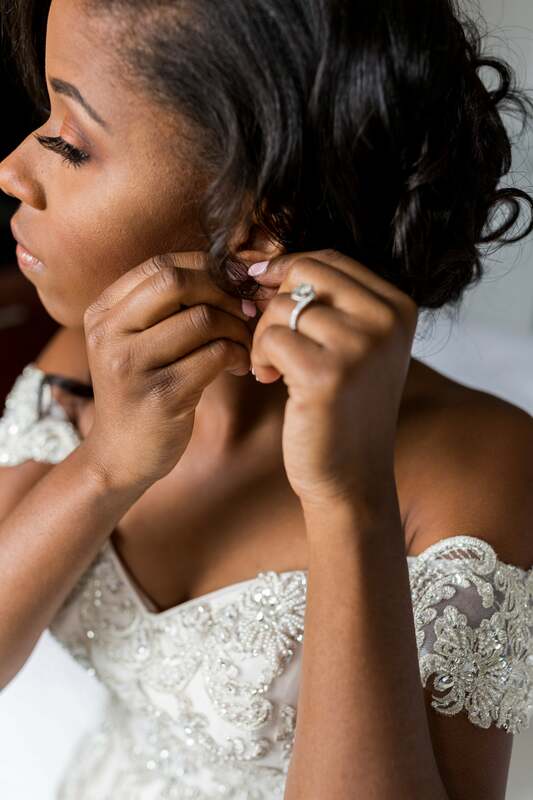 Isn't Alexis just a gorgeous bride?! 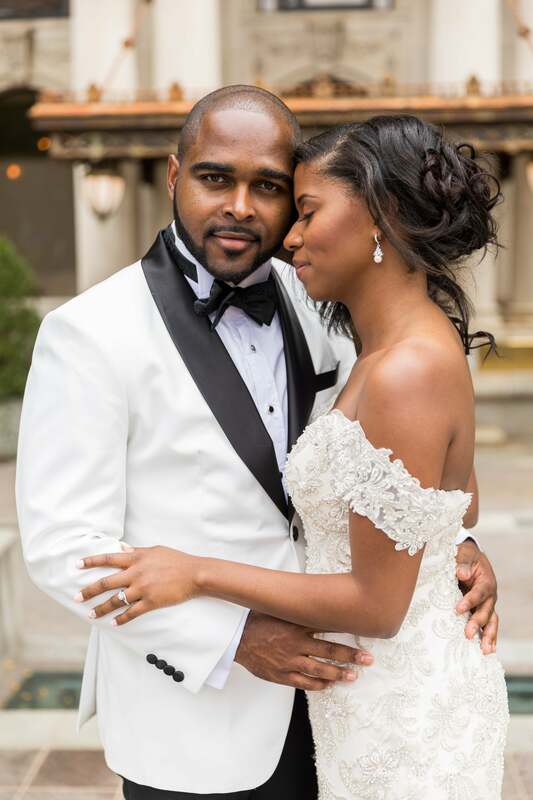 "Rashod is the most selfless, kind-hearted, patient, and forgiving person that I know," said Alexis of her groom. "When I met him, I was a pretty selfish, closed minded, impatient, and unforgiving person. It was like God was telling me 'Alexis, it’s time to grow up and change your ways,' and 'I’m going to put this man in your life to challenge you to become the woman of God that you’re destined to be.' I’ve definitely become a better person, and continue to strive to be a better person because of him. He is the calmest person during adversity and never allows anything to cause him to lose his cool. I tell him every day that if there were more people like him in the world, it would be a better place. Rashod is the type of person that has no enemies or people that dislike him. If you do, then you’re probably the person with the problem, because he’s the friendliest person you’ll ever meet." 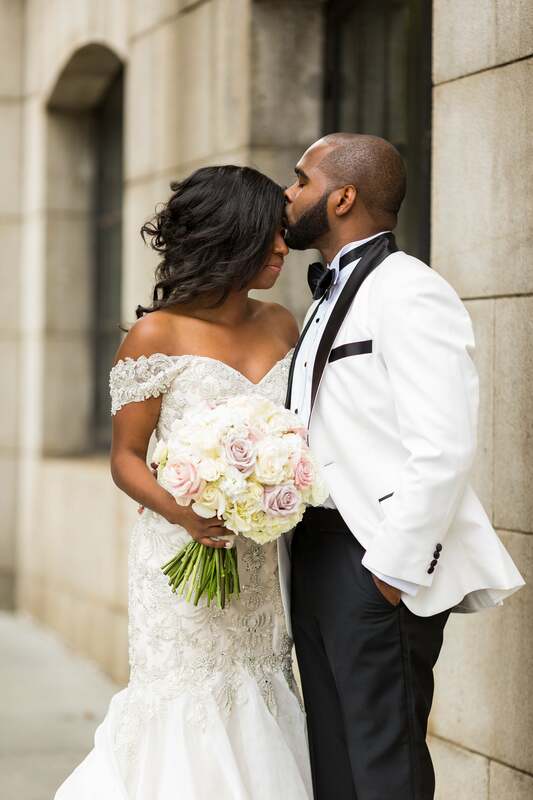 The bride was definitely surrounded by love on her wedding day who helped her with her every need before she tied the knot with the love of her life. 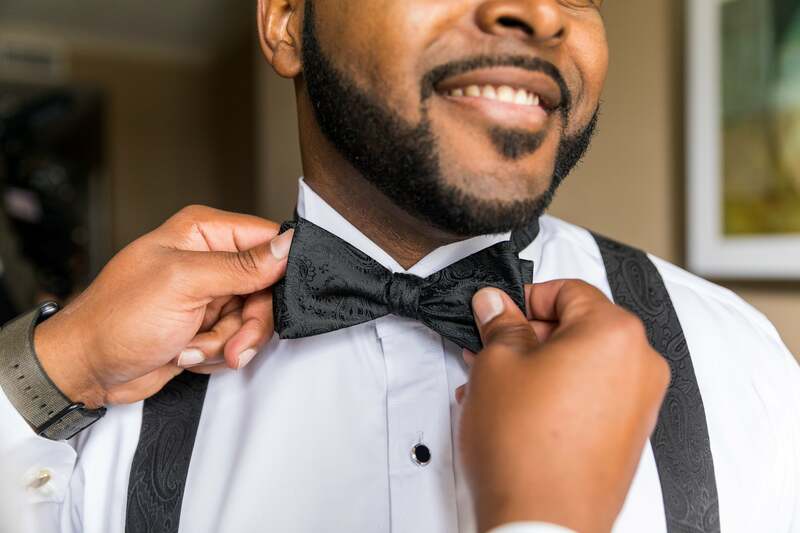 "When dating Rashod, I always saw him as someone that I could be with forever," recalled Alexis of when she knew he was the perfect guy for her. "He makes me want to be a more selfless person, challenges me to do what’s right, loves me for me, and always makes my heart light up when I see him regardless of the kind of day I’m having. In 2012, I left Washington, DC temporarily to pursue my Master’s Degree full time in Public Health at Drexel University in Philadelphia, PA. 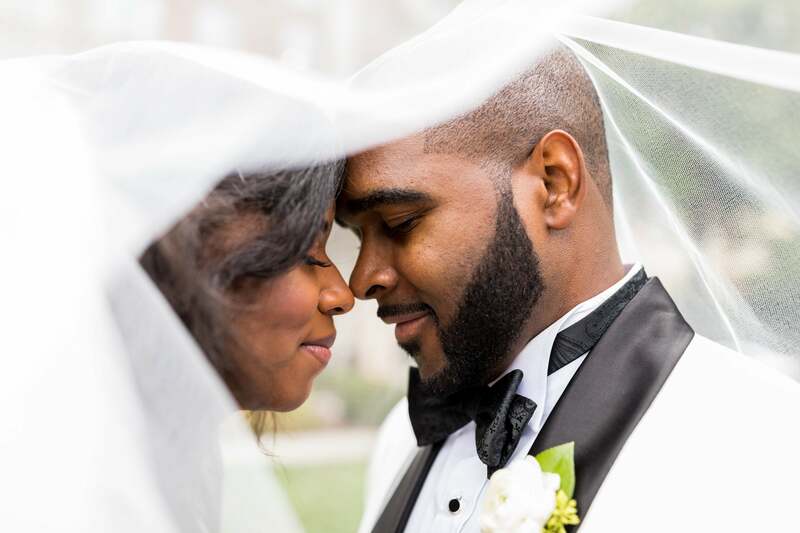 The long distance definitely made my heart grow fonder, and the time we spent together during his weekend visits to Philadelphia solidified my feelings of wanting to spend forever with him." 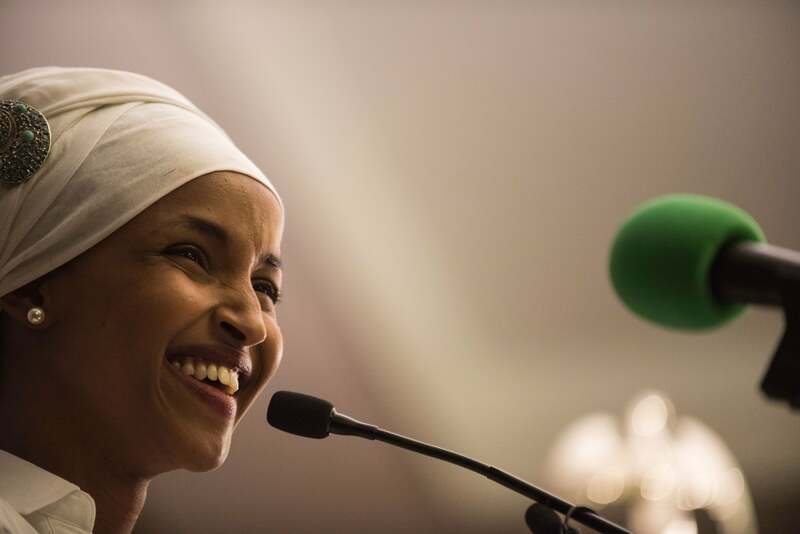 "At the 6-month mark, it hit me like “this is it” which was actually when I first said those three words “I love you” (yes, I said it first)," Rashod admitted. "It was the way we connected that just felt natural and effortless. I could be myself with her at all times and vice versa. However, I wanted to give it time to grow and be sure 100% sure. Shortly, after our 1 year anniversary, Alexis left for graduate school about 3 hours away in Philadelphia, which wasn’t far but it was then that I realized that truly never wanted to be without her." 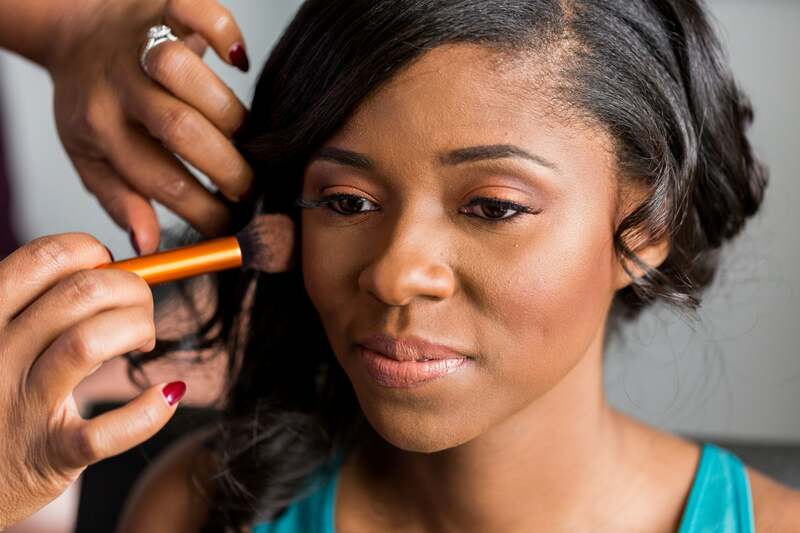 "I said yes because Rashod loves me for me and allows me to be myself," said Alexis. "I fell in love with his kind and selfless heart and how he always cares about my wellbeing. He makes me want to be a more selfless person, and always challenges me to do what’s right. Rashod holds me accountable for my actions, challenges me to do my best, and to have a good relationship with my family and friends." 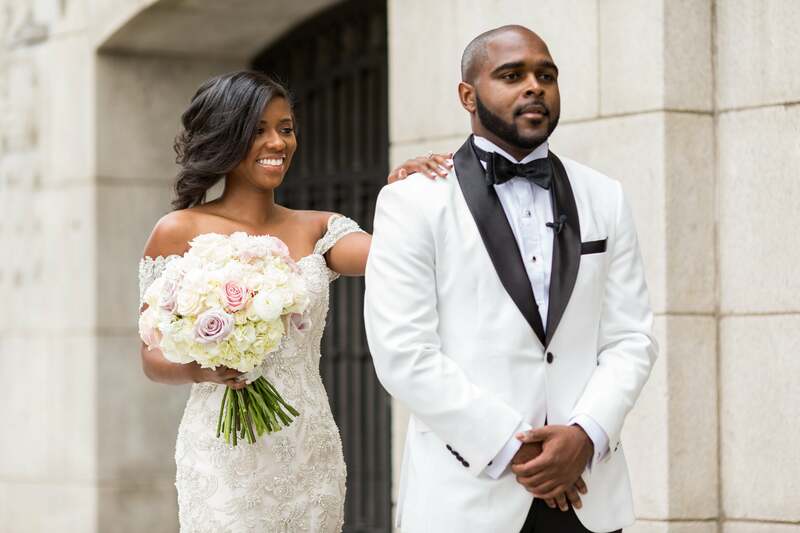 "I chose Alexis to be my wife because I knew I wanted her in my life forever," Rashod shared. "Whenever something in my life happened, she was the first one I wanted to tell or talk to about it. 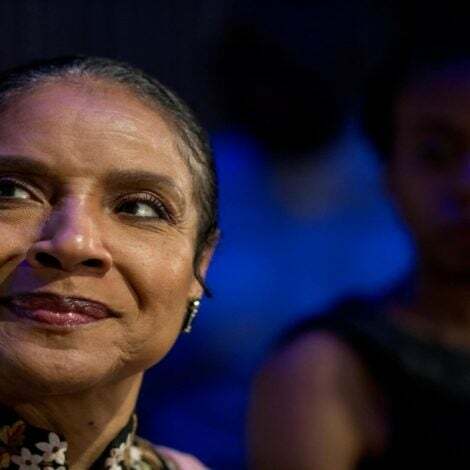 During our time together, she showed me all the traits I wanted in a wife and the mother of my kids. Something else that really helped me decide, was that one day we were going through some adversity and Alexis says 'can we sit down and pray together?' I knew then that as long as I have this strong, prayerful woman in my life then everything will be alright." 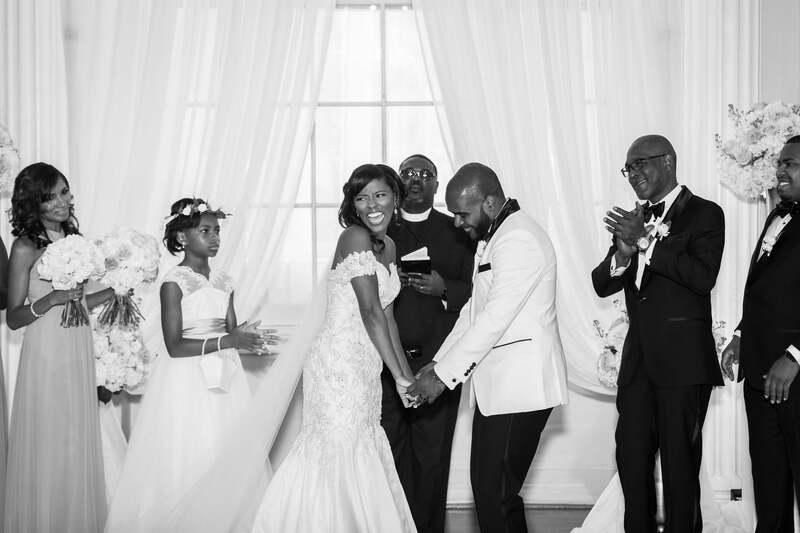 "I was so happy walking down the aisle," the bride recalled. 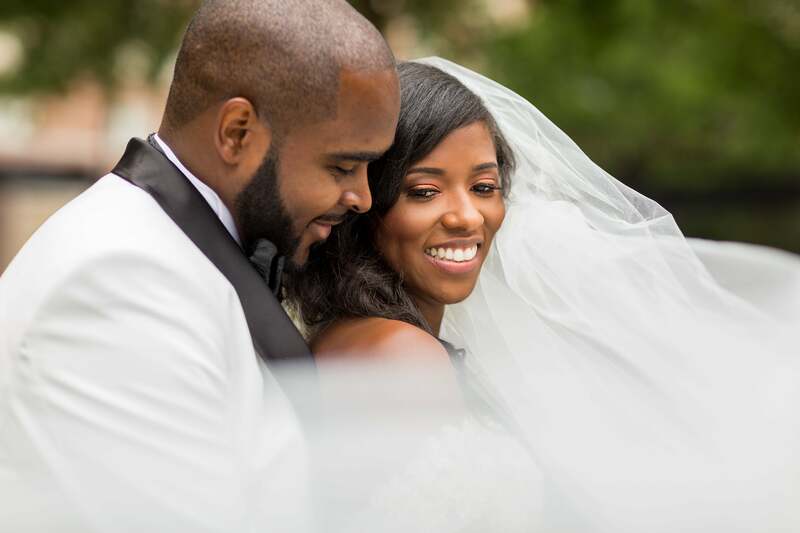 "When I saw his eyes and how emotional he was, it took everything for me to hold it together so that I would not cry and mess up my make up again, as I did from our first look." 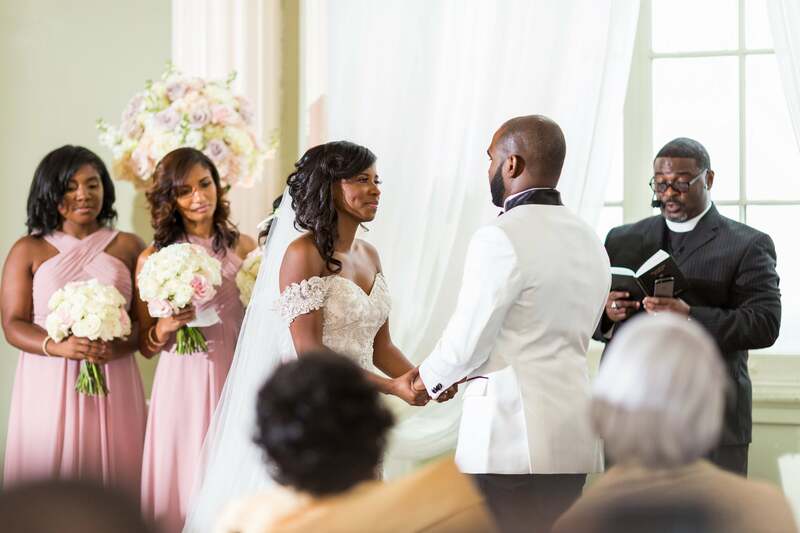 "Alexis is a strong, prayerful, intelligent, and funny woman," the groom said. "I start to laugh thinking about it because we have so much fun together just joking around and being silly." "It was the happiest I have been in a while. Standing up there with her, I just felt on top of the world, like nothing can stop us as long as we have each other," said the groom of being at the altar with his bride. 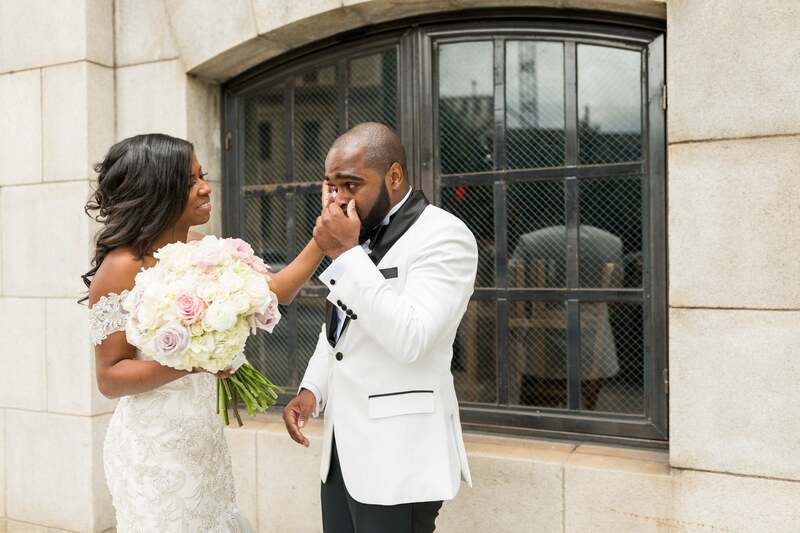 "When he proposed I was in shock and emotional that this was actually happening," said Alexis of how she felt when Rashod popped the question. "I was so overwhelmed with emotions that I could not stop crying. 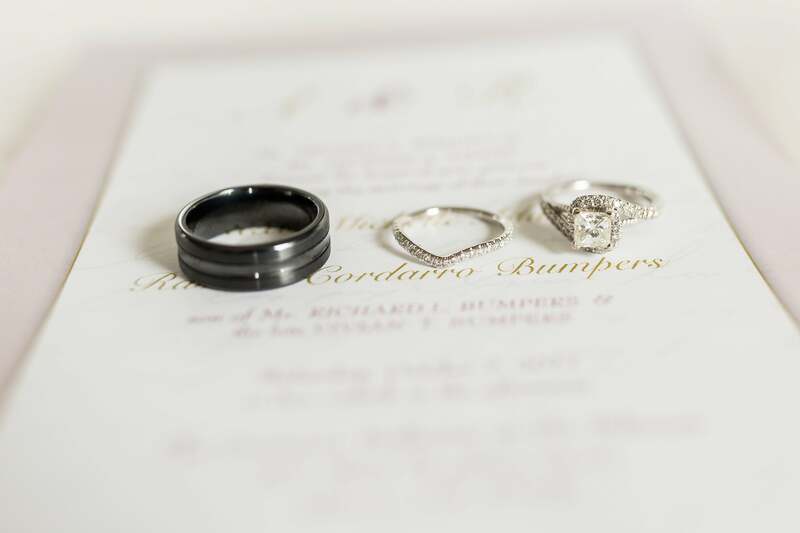 I thought of all the obstacles that we overcame to get to this point to start our journey towards marriage. It was one of the greatest feelings!" "Alexis is super family-oriented and loyalty is really important to her. She is incredibly loyal to me, her friends, her family, and my family which was huge for me. She will let you know very quickly, do not mess with her family or her friends. I used to joke with her and say, 'Babe I love you because I think sometimes you care about me more than I care about myself.' She is there for her family and friends no matter the situation or what may be required/asked of her. She takes on the feelings of those around her and considers everyone other than herself when making a decision or taking action." "There are so many things I love about him," admitted Alexis when asked what she loves most about Rashod. "I love our friendship, how he makes me laugh, the way he takes care of me and cares about my wellbeing, and how he inspires me to be a better person and treat others with kindness. In addition to all these things, it doesn’t hurt that he’s an excellent cook!" "It’s hard to pick one thing. I love everything about her. She’s loyal, family-oriented, driven, loves hard, supportive of everything I do, pushes me to be the best version of me, and just lets me be me." "I always knew that I would find true love but, but I didn’t know how, what it would look like, and when it would be. The beauty of me finding true love in the Rashod the way that I did is that neither of us was looking for true love at the time. We allowed God to take control, and our true love developed from our great friendship with one another." 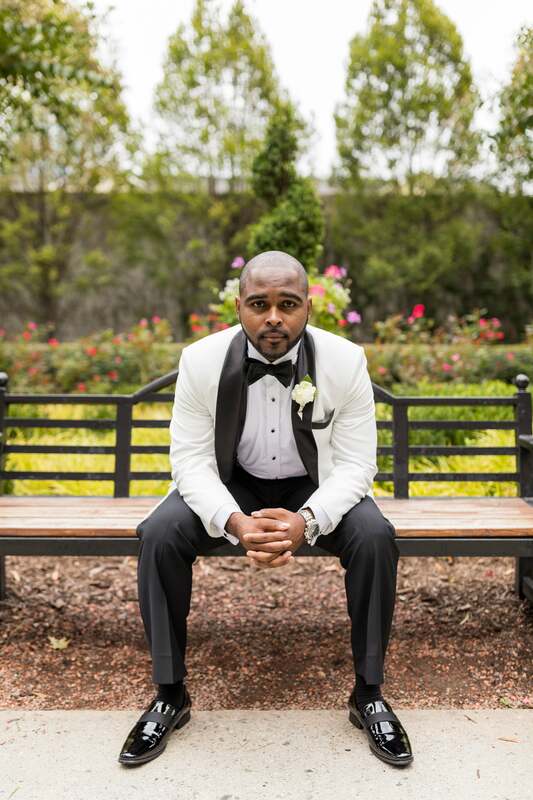 "In the Washington, DC area, I knew it would be tough," said Rashod about finding his true love. "After being in the social scene for a while, I did not think I would find it so soon. But when I did I knew I had to hold on tight." 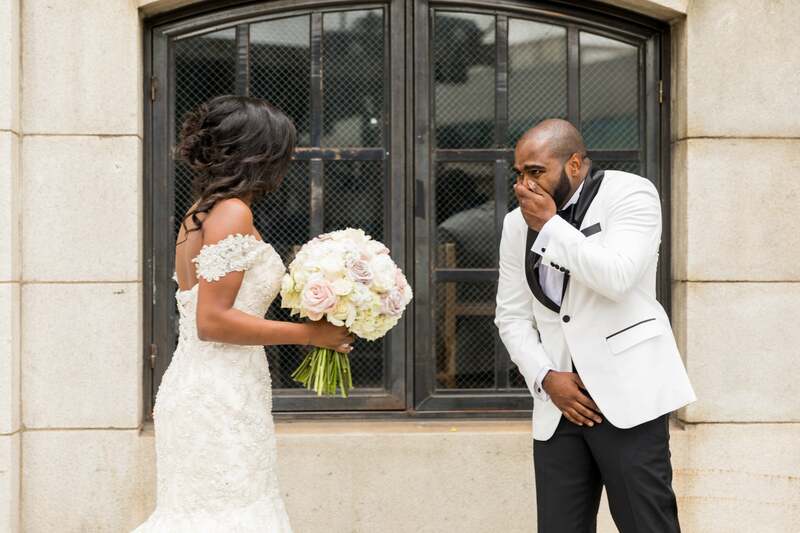 "I always thought to myself that I wouldn’t cry at my wedding but that day was really emotional for me," the groom said. 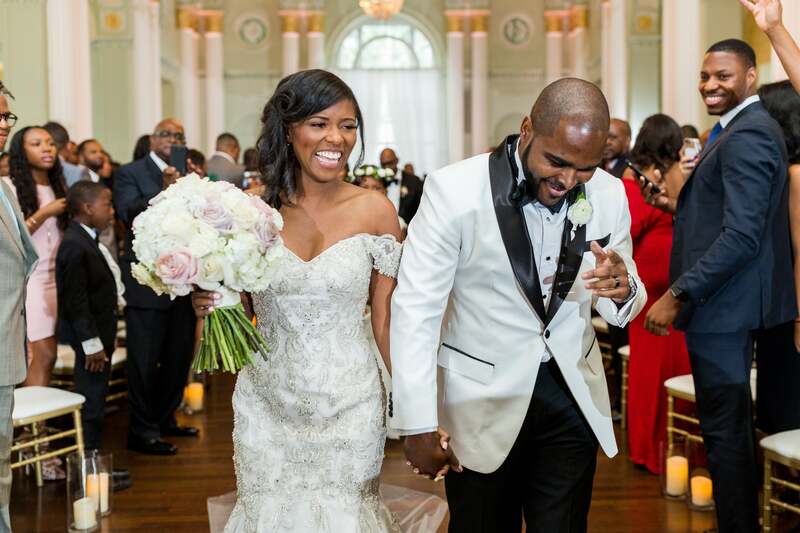 "It was this overwhelming sense of appreciation and gratefulness that I found Alexis and that she loves me for me." 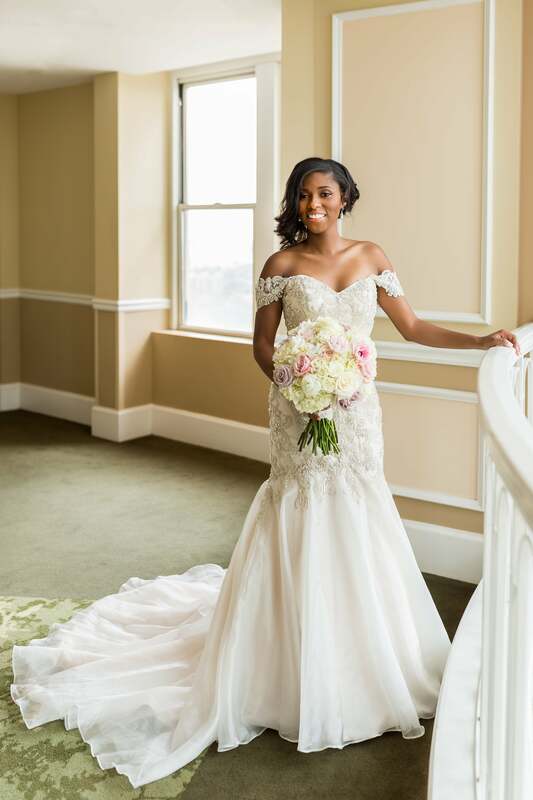 "I love hydrangeas, so that was one of the main flowers of the centerpieces and bouquets," the bride said of the flowers used to help execute her sophisticated elegance wedding theme and they definitely her gorgeous dress! 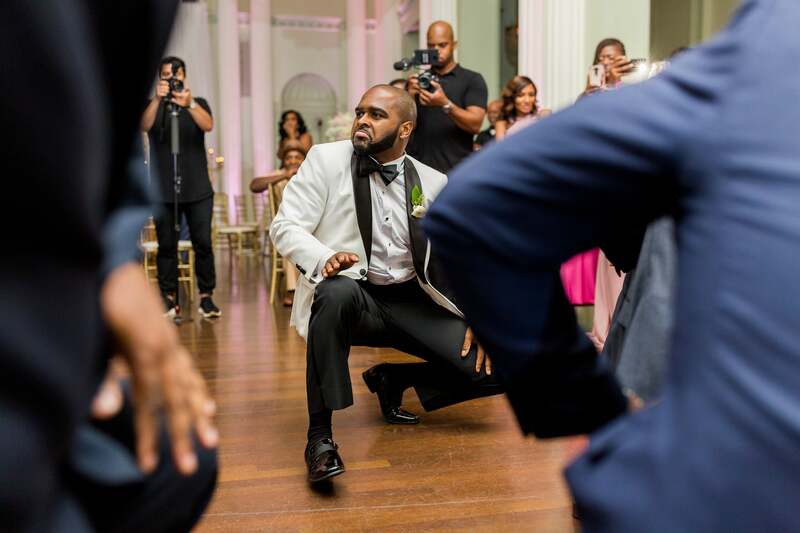 "Rashod included all of his Kappa Alpha Psi line brothers, his cousin, and his father as his groomsmen. His father (whom he’s extremely close to and has a friendship with) and one of his line brothers were his best men." 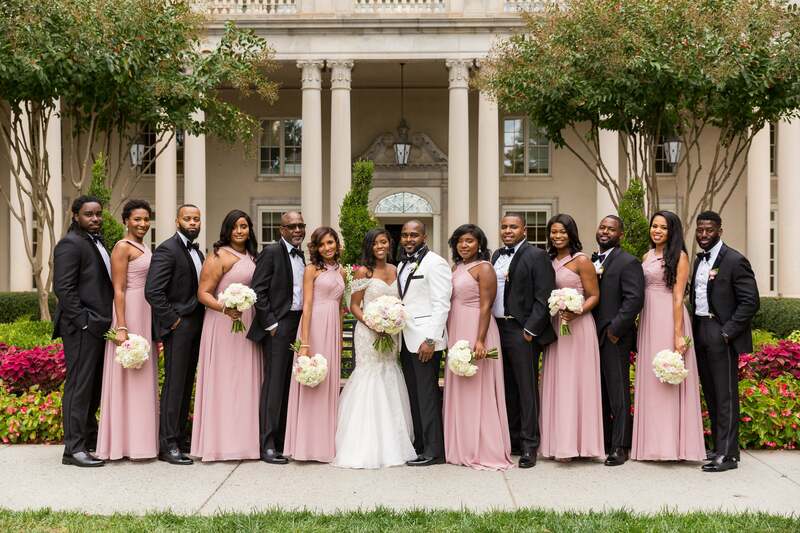 This is one looking bridal party! 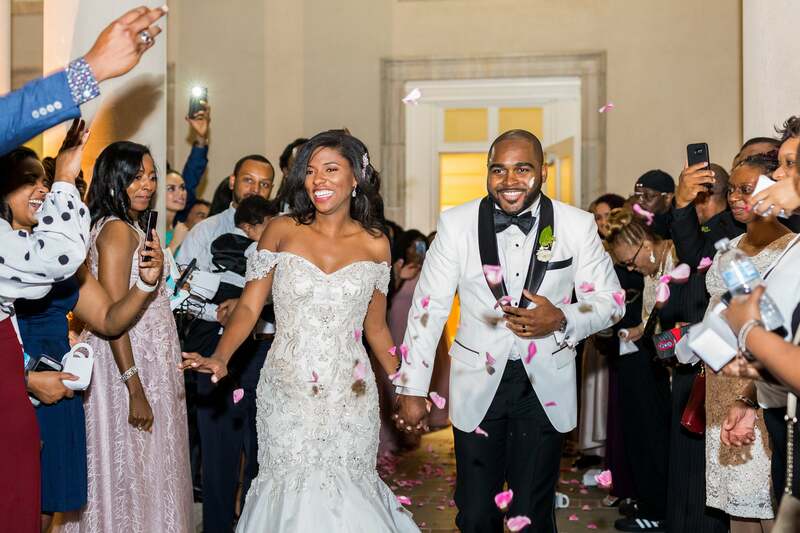 "Before our wedding, Rashod and I knew that we wanted to have fun and party at our reception. 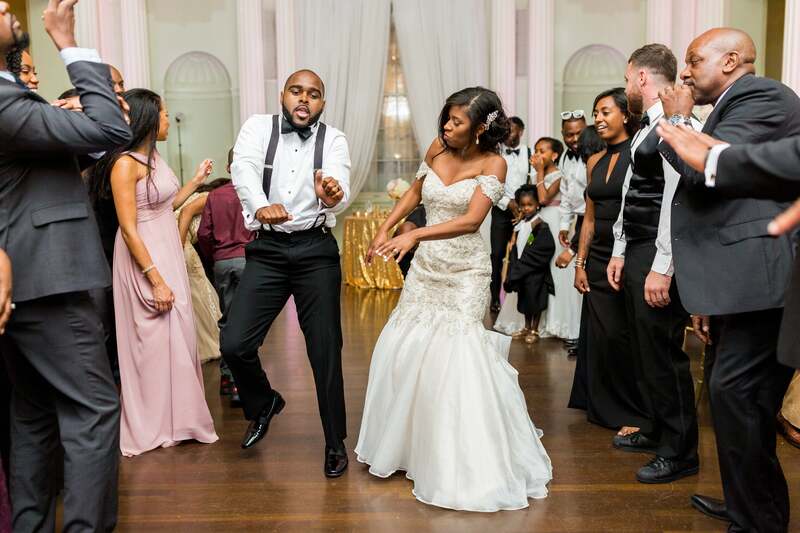 We wanted a song that would set the tone for a turn-up party, so we entered the reception to Fat Joe ft. Remy Ma’s "All The Way Up." We felt the energy from our guests as they rose to their feet to dance and cheer us on as we entered the reception. It was like a movie!" 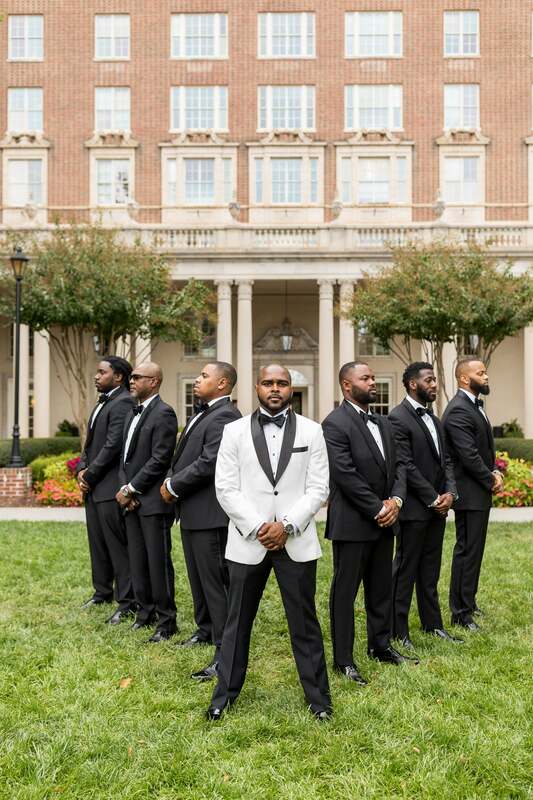 One of the bride and groom's favorite wedding day memories is when Rashod and his Kappa Alpha Psi fraternity brothers strolled during the reception. How dope! 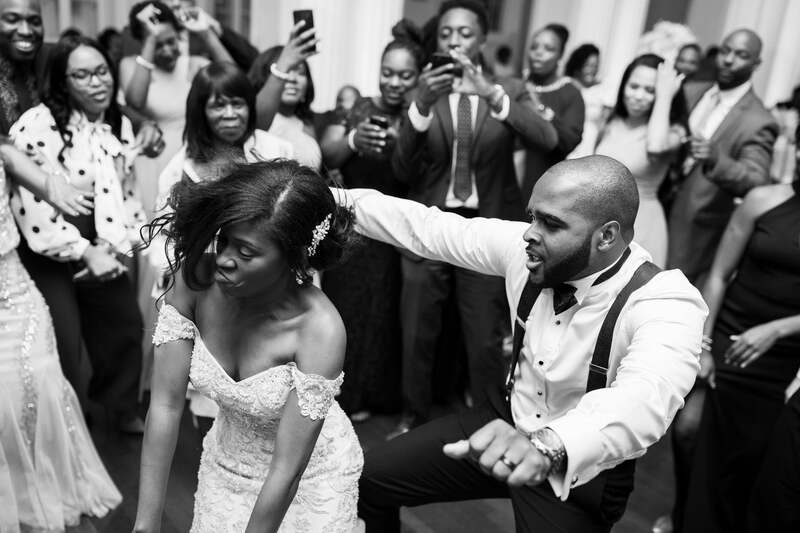 No one can deny that these two had a grand time at their wedding! 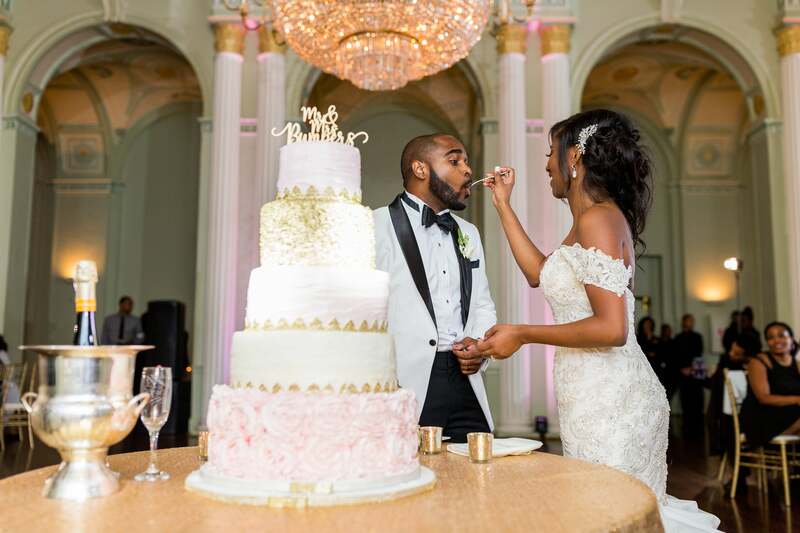 "Rashod doesn’t like cake, so he gave me full reigns in selecting the flavor for the wedding cake. For four of the layers, we choose to have vanilla cake. Two of those layers were raspberry filling, and the other two were oreo filling. The fifth layer was chocolate with dulce de leche filling." Yummy! 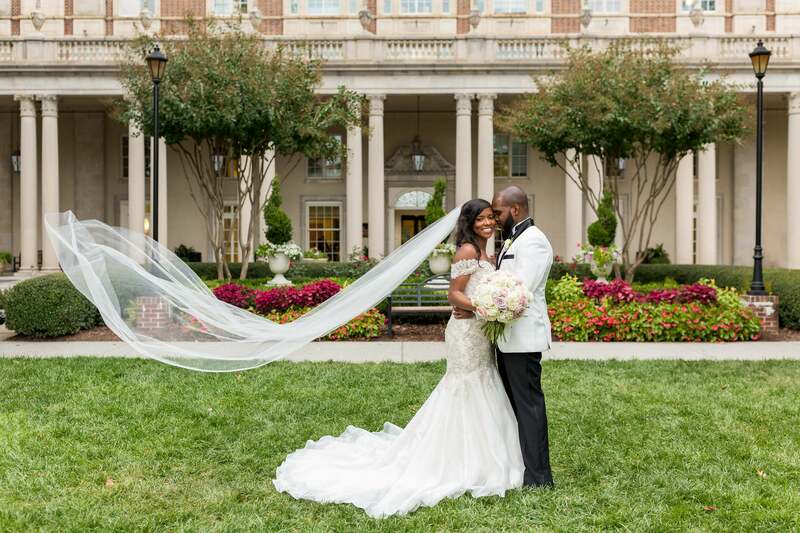 Here's to a lifetime of bliss for Alexis and Rashod!